This is the most universal, thermostatically-controlled water deicer on the market. Keeps water available and ice-free in the winter months for all animals and pets. 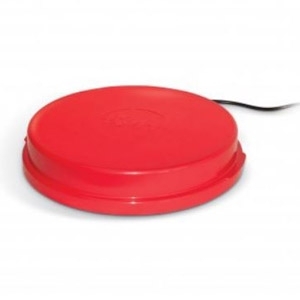 Can be used with aluminum and plastic Poultry Waterers, dog bowls, buckets, and other water receptacles. The bottom is sealed to prevent unwanted pests from nesting. 5.5-foot cord and molded handles make lifting and positioning the unit convenient. 80 watts. MET listed. Two-year limited warranty.